Organic Formulations founder Daniela Tarantello and national business manager Kerry Henry are welcoming people to the new Gisborne store. 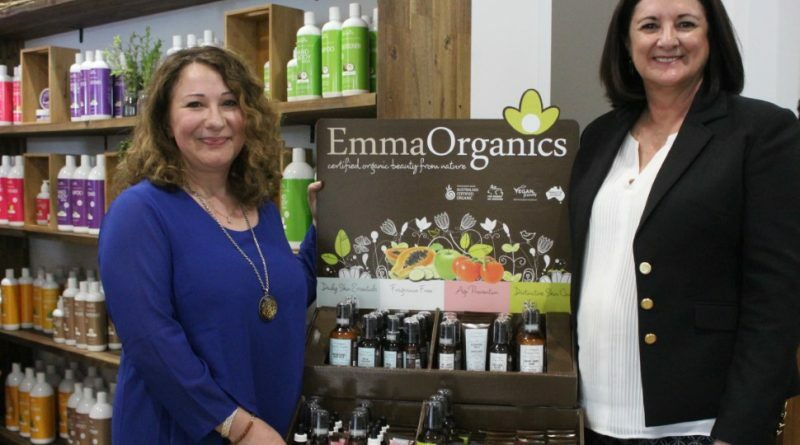 One of the first companies to bring natural and organic alternatives to the Australian market is based right here in Riddells Creek and has now opened its first concept store in Gisborne. 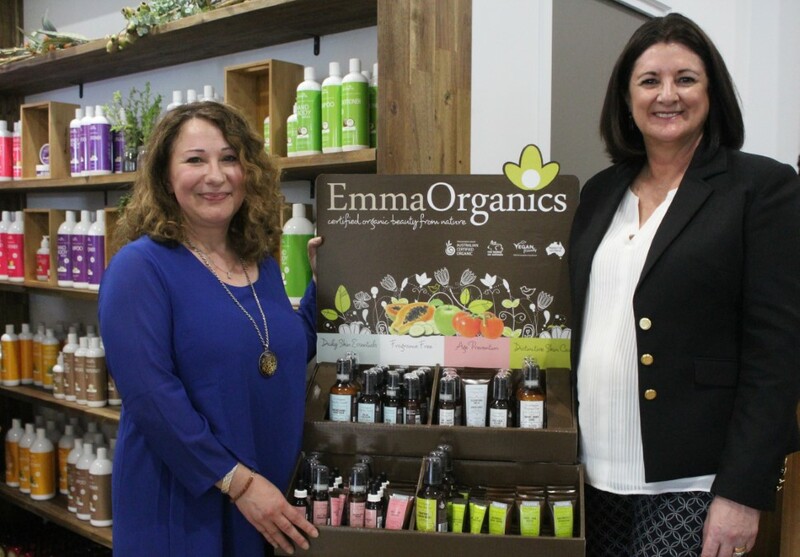 An international success, Organic Formulations has been manufacturing organic and natural body care and environmentally friendly cleaning products in Riddells Creek for the past 18 years. National business manager Kerry Henry said the new store at The Village Gisborne was in response to many “knocks on the factory door” to purchase product. “Since the manufacturing facility is not a public place we have looked for a retail shop where all of our range of products can be made available,” she said. Daniela Tarantello is the founder of Organic Formulations and was a pioneer in processing organic products. 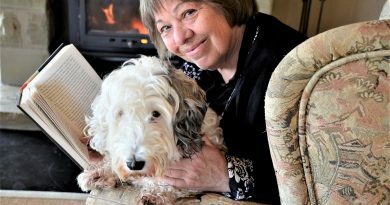 Her brand was developed for a “healthy lifestyle in complete harmony with the environment”. “By supporting Australian certified organic farms and certification bodies, we are ensuring the consumer is made aware of the ramifications pesticides and chemicals have on our environment and our bodies,” she said. “We started this business in Riddells Creek 18 years with two employees, we now employ more than 26 people in this area, and we have always refused suggestions to move our facility overseas looking for cheaper labor. Ingredients are carefully sourced from mostly Australian organic farms and suppliers with the aim of supporting local producers and suppliers while creating sustainable products to be proud of. “Over the years we have learned to adapt and listen to the consumer, our aim is to always be at the forefront of new ingredients sourced from farmers and/or producers whom are shifting from chemicals derived to naturally and organic derived,” Ms Henry said. The first certified organic toothpaste, made with more than 95 per cent organic food grade ingredients, was the ‘Riddells Creek toothpaste’ which was first sold overseas and Australia-wide following increasing consumer awareness. Organic Formulations’ Riddells Creek toothpaste, oral care and bath/body oils, Australian Biologika Body Care, Emma Organics Skin care, and Ecologic Household Cleaning products were named the number one environmentally friendly products in Australia by an independent laboratory and listed in Choice magazine back in 2004. The same formulas are still used today and are more popular than ever. Newer product lines include the ‘Unique Selections’ and ‘Ecosoothe’ range. 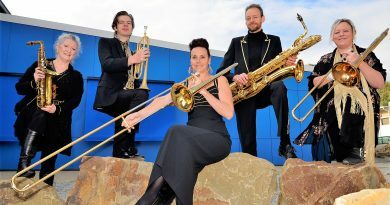 Members of the 18-piece Goldfelds Jazz Orchestra, Jude Russell, Emmanuel Hall, Kirsten Boerema, Michael Timcke and Wendy Laidler are looking forward to the orchestra's big debut gig at the Castlemaine Jazz Festival. 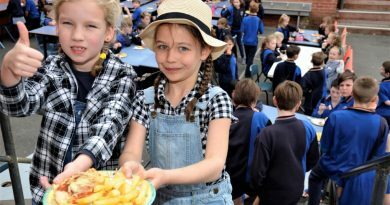 Young Ainsley Nash and Kate Hemphill dressed in farm-themed attire especially for Castlemaine Primary School's Parma for a Farmer lunch on Friday.